My Journey to Fit: WWU - Thank You, Aly Raisman! WWU - Thank You, Aly Raisman! "When I salute, I remind myself I've worked really hard and that I'm good" - Aly Raisman, U.S. Olympic gymnast. Image taken from the video where I heard her quote. ...and to calm her nerves, she reminds herself that she worked really hard and that she's good. I love this. I love that she gives herself such an empowering pep talk right before performing her routine. I love the symbolism of her raised arms. I love the acknowledgement of her training. I related this story to my running buddies at breakfast, and it clicked with them, too. As you might remember, I've had some pretty terrible race anxiety for years now, so I'm going to borrow Aly's pep talk. Because while I'm not the fastest runner out there, and I don't win my age group, I DO work really hard at running, and I AM good at it. So next time I race (and heck, maybe even next time I do a long run), I'm going to take a moment to pause, raise my arms in the air, and remember Aly's words. And then? I'm going to do my best - period. So thank you, Aly - and hey - congratulations on making the Olympic team again! Good luck in Rio! This would be Jeff's sweat angel. You can even read the backwards "just run" words that were on his shirt, if you look carefully. Actually, our run was a little different because we met at a different park. While I walk there with Jenny all the time, I haven't done a run in that area in years. Jeff went one direction while Karen, Andi, Julia, and I went another. Julia and I ran together for the first time in forever and tried to catch up on each other's lives, but most of the conversation *gasp* went *gasp* like *gasp* this. No worries, that's what breakfast is for! Anyway, we ended up doing a mile run along the street, which actually was nice - we were running just slightly at a downward slope, and there was a bit of a breeze. Even with having to wait for a green light at a big intersection, my first mile was 13:18, which was great for an easy run in hot weather. After we turned around, the breeze disappeared and so did our downhill slope - the second mile was a bit more challenging. We did some random intervals during our last mile, like running to the light post with the yellow tape on it, then walking to the edge of the bridge, and so on - it's not the most technical way to run, but the result was nearly the same as if we'd had our interval timers set on our Garmins, so it was all good. This week is more running and walking and mostly trying to survive exercising in our hot and humid climate. I'm not amassing a lot of miles, but I am out there, and that's something. I read that they are calling her "Grandma" (in an affectionate way) because she's the oldest one on the team (22, HA!). I can't wait to watch her next month! You are consistent in your running for years now and can be proud of yourself, I know I am, you are such an example. I found this blog yesterday through a Dutch food blogger. That watermelon smoothie recipe looks delicious! I like that quote too. It tells us that even an Olympic athlete struggles with feeling "good enough." Also, not to make light of it, but it reminded me of one of my favorite characters, and gave me a good laugh this morning--Stuart Smalley! 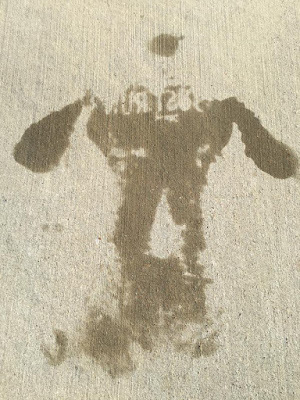 That sweat angel, where you can read the writing, is CRAZY!!! In yoga, we call what Aly does "honoring yourself". Namaste. That is a great ideology. We may not be "the best" at something but we are doing the BEST we can and that makes us good at it! Exactly - if we're out there, we ARE doing our best, and that should count for more than probably most of us allow credit for. I really like that she worked hard *and* said she was good. Too many times we try to downplay our accomplishments so it doesn't sound braggy, but if you work hard and have success - own it! Yep - I loved that she owned it. That is an awesome quote!!!!!!!! Thanks for sharing!!! !